I will start off by saying something that most other review websites won’t tell you. 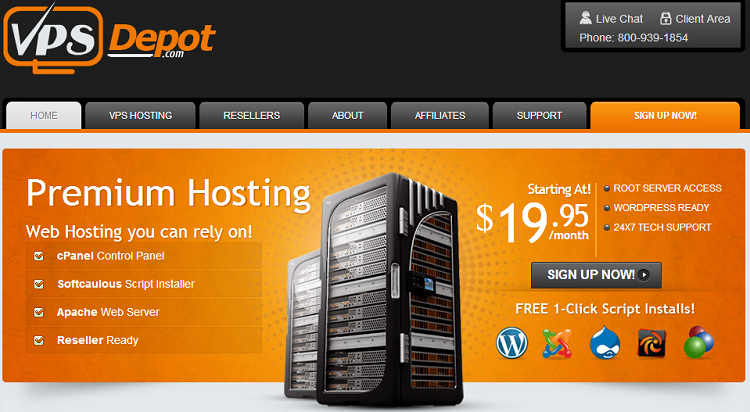 I host this site, as well as many of my client’s websites, on VPSDepot. Their servers are inexpensive, responsive, and reliable. Virtual private servers can get expensive, especially with all the addon features that web hosts will try to sell you. VPSDepot is different in that they don’t really do anything like that. Every VPS option they offer includes cPanel and is semi-managed. This means you don’t have to pay extra for cPanel licenses or added support or anything like that. I have a strong feeling that they will soon become a very widely known virtual private server company. As outlined a bit above, VPSDepot doesn’t try to upsell or oversell additional products or features. Every plan not only comes with cPanel/WHM for easy management, but every single server is reseller enabled. There is no premium that you have to pay in order to resell your services to your clients that may need hosting. I have yet to find another host that doesn’t charge extra for the reseller option. For as little as $19.95 a month you can have a reseller enabled VPS with cPanel/WHM which is pretty unheard of. At the prices they offer, VPSDepot provides features that other VPS providers don’t match. cPanel/WHM is standard, as well as all upgrades, a free firewall, RAID protection, the ability to resell services, and more. If you compare the features that VPSDepot offers to any other VPS provider, you will have a hard time finding any company that stacks up. 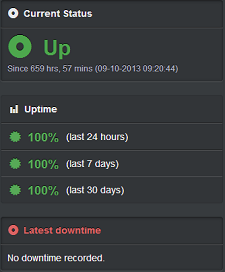 Simply put, I have had 100% uptime with VPSDepot. It really doesn’t get much more reliable than that. Since I transferred to new monitoring software in September I have had no downtime, and response times have averaged around 130 milliseconds. I account this to their semi-managed servers. The VPSDepot support techs actively monitor the servers and are quick to react to any issues they may have which give the highest uptime possible. Also offered is a free firewall, RAID protection, and more system level monitoring to ensure the best reliability in the industry. The server admins at VPSDepot are really helpful. While most of their time is spent monitoring all the back end stuff so you don’t have to worry about it, they are always available if you need help with your account. From simple things like setting up additional cPanel users to installing advanced plugins, they are a great group. There is a reason that I host my websites with VPSDepot and do my best to have all my clients that require a virtual private server host there as well. Their reliability, friendliness, and cost effective plans make it almost impossible to go with any other host. I’ve been with them for years and can’t imagine hosting anywhere else. They really are head and shoulders above their competitors.